September 7, 2017 — Links International Journal of Socialist Renewal reposted from MR Online — Amidst imperialist interference, the people in Venezuela are carrying on the task of reorganizing their society. Real-life picture in Venezuela is far different from new-reports the mainstream media continuously circulates. The following interview of Christina Schiavoni, a researcher and food sovereignty activist, provides a different view of the life of the Venezuelan people than we normally get from the media. The interview covers food and health situations as well as on-going politics and people’s participation in the politics. The interview was conducted by Farooque Chowdhury and Fred Magdoff, in August 2017. Q 1: Every day we are being bombarded by the mainstream media with Venezuela related news. Will you, please, share with us your recent experience in Venezuela? Christina Schiavoni: Sure. I am a food sovereignty activist and a PhD researcher. I am originally from the US and my research institute is based in the Netherlands, but I have been living in Venezuela over the past year and a half, examining food politics here. It’s been quite the dynamic moment to be here doing this research! One of the best parts about it is that I have been living with friends – a family – in the working-class neighborhood of El Valle, Caracas. This has given me a direct glimpse into the daily realities facing the majority of the population, which is urban and working-class. At the same time, I have had the opportunity to visit other parts of the city and to travel to more than half of Venezuela’s twenty-three states to witness other realities. The main thing I’d like to emphasize about daily life in Caracas is that indeed people are carrying on. Markets are bustling, children are playing in the streets, cultural activities are happening, etc. There is a major disconnect between this reality and what’s presented in the news, which looks as if Caracas is a war zone. Those images, e.g., of masked protestors in direct confrontation with police forces were from demonstrations largely confined to the wealthier areas of the city. For communities such as El Valle, daily life is more or less the same as usual. The only thing is that when the demonstrators blocked the roads, even in other parts of the city, this had ripple effects on transportation more broadly, making it hard for people to get to work, school, appointments, etc. And, then, of course, there were the impacts of ongoing economic destabilization activities, which I will get to shortly. The other thing I’d like to emphasize, which I hope to speak to more as we go on, is that all of the grassroots organizing and mobilizing that the Bolivarian Revolution has been known for over the years is very much alive and kicking right now. This was never of interest to the mainstream media, but even the alternative media has been rather remiss in its coverage, and far too often it is as if the people, communities, and movements that are doing a tremendous amount of inspiring work on the ground are invisible. Q 2: What’s the food situation – availability and access – in the area you were/are staying? When I first arrived to Venezuela in March 2016, food access was a huge daily challenge for the family I live with and for others in El Valle and other working-class communities. Corn flour, the main ingredient of arepas, a type of bread that is a critical daily staple for Venezuelans, was missing from supermarket shelves. So were other daily necessities like cooking oil, milk powder, and sugar. This was a major source of stress and insecurity for many families. The only way for most people to access these items was to stand in long lines outside of the stores where these were available in limited quantities or to buy them on the parallel market at many times the regular cost. Two aspects I want to stress is that there was never an overall food shortage in Venezuela, but rather shortages of key food items, and also that many of the missing items including corn flour are perhaps not-so-coincidentally controlled by the country’s largest private food company, whose owner is a prominent member of the political opposition. More on this can be found here. This situation has now been substantially improved thanks to the formation of CLAPs (Comités Locales de Abastecimiento y Producción), local food supply and production committees. Through these committees, which were initiated soon after my arrival in spring of 2016 and now exist across the country, communities organize themselves to coordinate directly with the government to access and distribute the basic goods missing from supermarket shelves. The family I live with now receives a large monthly packet containing corn flour and other essentials. Thanks in large part to the CLAPs, the lines outside food stores have been dramatically reduced, as has the influence of the parallel market, even though it continues to exist. Overall, there is a much greater sense of security not only in El Valle, but also among the other communities I have visited in Caracas and elsewhere in the country. This is not at all to say that food access issues are now resolved. While some CLAPS are involved in more transformative activities, most are at best a stop-gap measure to address fundamental cracks in Venezuela’s food system, as evidenced by the shortages. Venezuelan food sovereignty activists have visions for much deeper transformation, and indeed are working toward this, building off of prior efforts of recent decades. This has been a focus of my research. Q 3: Have you experienced any food riot or looting of food stores in the area you were/are staying? In the year and a half of living in El Valle, I witnessed looting there one evening, back in April of this year. This was mainly carried out by groups of young men, and word has it that they were paid to do so, although I cannot personally verify this. Tragically, several lives were lost when a group entered a bakery where there was construction and was exposed to a live electric wire. The looting was stopped primarily by the community members themselves, who flooded into the streets to confront the looters, and they have since ensured that such an event will not be repeated. What impressed me about this somber moment was the level of response. Early the next day, neighbors were out en masse sweeping the streets and fixing damaged storefronts, and a large community assembly was held in the main plaza. I was also impressed by the sharp political analysis and level of consciousness in community discussions as to what had happened and why. With the exception of that night, El Valle has been quite peaceful, in contrast to the wealthier communities where the opposition demonstrations are concentrated. Q 4: We would like to know the health situation – current prevalence of diseases/health problems, operation of health centers/hospitals, availability of medicines and other health care items – in the area you were/are staying? There are two divergent things going on here. On the one hand, access to health care is better today than it ever was in communities like El Valle. For the most part, people had to travel outside the community to receive health care in the past, and that was if they could afford it. Today, there are blue-roofed health clinics characteristic of the government’s Barrio Adentro program dotting many street corners in El Valle, as well as larger facilities, such as a maternity hospital and a rehabilitation center within walking distance from where I am living. Through the Bolivarian Revolution, health care is now free and accessible. Two of the friends with whom I live recently got new pairs of glasses and one of them has been receiving special physical therapy sessions. These are high-quality services accessible to all community members and free of charge. On the other hand, a neighbor’s son has been unable to access his anti-seizure medication and another neighbor with a chronic health issue has also been having trouble accessing her regular medications. And such situations are magnified many times over across the country. Shortages of medicines and certain medical supplies are a major issue. And what’s worse, as with the food shortages, there is evidence indicating that the shortages of medicines are also manufactured. The prominent Venezuelan economist Pasqualina Curcio has documented that the main pharmaceutical companies responsible for importing medications are receiving more dollars than ever from the government and yet the availability of medicines has dwindled. Whatever the case, further action is needed to address this. I should also mention that, outrageously, some of the government-supported community health centers have been among the targets of violent opposition demonstrations. Q 5: Have economic/production activities come to a halt in the area due to political turmoil at national level? The main economic activity in El Valle is retail, through both the formal and informal economies. There is a large shopping center there, as well many independent shops and a large array of street vendors. Shopping centers and street markets remain bustling, but people’s money goes a lot less far these days due to high rates of inflation, which is surely taking a toll on retailers. So I can say that things have far from ground to a halt, but many retailers are surely having a hard time of it. I particularly worry about the many informal street vendors, as there are also currency shortage issues, so many people are opting to pay for purchases electronically with debit cards. Some of the larger street vendors have their own mobile card readers and some of the smaller ones team up with the larger ones or with nearby shopkeepers to accept payments by pin. But I’m sure that people’s reduced disposable incomes together with the currency issues are taking their toll. I also worry about the economic impact of the roadblocks the elements of the opposition were carrying out, which were disrupting transportation more broadly, as I mentioned earlier. I’m not sure how much this has impacted retailers in El Valle, but there is a weekly farmers’ market in another part of the city that I like to go to, which was closed a number of times due to the roadblocks. I think of both the food loss and the economic costs to the farmers and the vendors each time this market was closed, and I think of all the similar situations there must be throughout the country. Going back to the food shortages, I’d also like to talk about the flip side of the coin, which are the many resourceful and creative responses that have arisen to them. Many households including my own are growing what they can on windowsills, patios, etc., and urban agriculture is becoming more mainstream, facilitated by a newly formed Ministry of Urban Agriculture. Many people are also coming up with new culinary innovations, or returning to old ones, to substitute the products missing from shelves. For instance, we regularly grind our own corn at home now to make our arepas, which are healthier and taste better. Even though processed corn flour is a bit easier to access now thanks to the CLAPs, many people are continuing to grind their own corn. People are also experimenting with making arepas out of alternative starches such as plantains, cassava, and sweet potatoes, which remain abundant. You now see a lot more bartering arrangements between neighbors, as well as new microenterprises popping up selling items such as freshly ground corn dough. And, that’s just as the household and community level. There are also some very innovative efforts to confront the shortages being piloted by social movements. These include a very popular large monthly market in Caracas featuring artisan made alternatives to the items missing from supermarket shelves as well as project directly linking producers and consumers, reaching tens of thousands of people in less than two years since its inception, just to name a few examples. In some cases, these social movement-driven efforts are linking up with government supported efforts such as the CLAPs, magnifying their impact. Q 6: What’s your experience of shopping in a market place? Food shopping can be quite the adventure these days in Venezuela. Supermarkets are absolutely surreal. At first there’s an air of normality, but then you notice that certain products are missing while others are in abundance. It thus becomes somewhat of a scavenger hunt to see if the items on your shopping list are all there. This has recently been partly addressed by the government through facilitating more food importation and cracking down on illegal practices, so certain products that had been missing are starting to reappear, albeit at higher prices than before. Inflation is definitely an issue, with food prices regularly increasing (Here I also refer readers to the work of Pasqualina Curcio, who has looked at how inflation, which has long been a byproduct of Venezuela’s petroleum-centered economy, is being intentionally exacerbated). These days I avoid supermarkets as much as possible and opt for open-air markets and street stalls, where fresh food is ubiquitous and much more affordable than supermarkets. I live one metro stop away from the largest open-air market in the city, which is bustling every weekend. The products there are mainly sold by intermediaries, but there are also markets where you can buy fresh products directly from producers. There’s also the monthly alternatives market that I mentioned, which I absolutely love! More than a market, it’s also a hub for education and organizing on food sovereignty issues. Q 7: Now, we would like to enter into a delicate part of this interview. It’s the political scene now dominating Venezuela. What’s your experience of political activities going on there? We request to center your narration on the area you were/are staying. El Valle is a hotbed of the type of community organizing and political mobilization that forms the lifeblood of the Bolivarian Revolution. Community assemblies, both planned and spontaneous, are the norm. Shortly after my arrival there, one of the main issues people were organizing around was food distribution, particularly via the formation of CLAPs. I attended a community sancocho (gathering over a big pot of hearty stew that’s a popular thing in Venezuela) where leaders of different CLAPS in El Valle had gathered to talk both logistics and politics. Visions went far beyond emergency food distribution to new types of community-based socio-economic activities to give communities greater autonomy and reduce the power of the country’s powerful private food industrial complex. Then, the announcement by Maduro on May 1st proposing a constituent assembly process to revise the national constitution, safeguarding the wins of the Bolivarian Revolution while deepening the process, breathed an almost electric energy into El Valle. From then on, el constituyente became the main topic of discussion, from chats among neighbors to social movement gatherings to meetings in the PSUV (main Chavista political party) headquarters in El Valle. The discussions I witnessed started out broad – for instance, about the goals of the constituyente and how it compared to the earlier process in 1999 when citizens had rewritten the constitution in a similar fashion – and then got increasingly focused, for instance narrowing in on specific articles of the constitution in need of revision or strengthening. This past election day on July 30th was a highly celebrated day in El Valle, and since then, much activity has been taking place as people begin the actual work of the constituyente. Q 8: Please share your experience of the so-called referendum organized by the opposition? The referendum by the opposition did not generate very much buzz in El Valle, although some people there did participate in it. It was far overshadowed by a dry-run of the constituent assembly elections, which took place the same day. Q 9: What is your experience regarding the election of the Constituent Assembly? As I said, the day of the Constituent Assembly elections was a big day in El Valle. I spent some time at the nearest polling site, which had a long line extending down several blocks. The mood was highly festive. From there, my friend and I took a bus to the main ‘contingency site’ that had been set up in a large stadium nearby. For those confused by the recent headlines on Venezuela, this is a point worth explaining. The so-called ‘peaceful’ ‘pro-democracy’ demonstrators of the opposition had made threats against those who planned to participate in the Constituent Assembly elections, leaving many people fearful to vote in their own communities, particularly those with a strong opposition presence. This fear was not unfounded, as these demonstrators have been known to resort to violence, going so far as burning people alive on a number of occasions, several of which have been recorded on film. So for people unable to vote in their own communities for fear for their safety, an alternative voting site was set up. This site had long lines pouring into it when we arrived, with people from all over the greater capital area. A number of other sites that we passed along our bus ride – at least three – also had long lines outside of them, late into the day. Q 10: Can you describe the debates and/or discussions on economic or political issues in the area you were/are staying? A big topic of debate, especially in the face of the constituyente, is how to keep the revolution as fresh as possible, particularly nearly two decades into the process. Of particular interest is the balance between the unharnessed power of the people, or constituent power, and the more established power of the government, or constituted power. Earlier on in the Bolivarian Revolution the boundaries between the two were so blurred that at times they were nearly indistinguishable. While there is still much blurring into the present, some of these boundaries have become more distinct. So there are discussions and debate on how to keep leadership as fresh and as directly connected to and accountable to the grassroots as possible. There is also discussion and debate on how to deepen the processes of ‘protagonistic participatory democracy’ that have been a driving force of the Bolivarian Revolution. In Chavez’s final speech, what he emphasized most was the importance of continuing to construct the comunas, which are citizen-led social structures intended to transfer power from the state directly to the people. Indeed there has been a great push for construction of comunas, but there is also concern that this has taken somewhat of a back seat in terms of government priorities in the face of current challenges, with the government putting more emphasis on CLAPs than on comunas, for instance. Many see the constituyente as a major opening for the further advancement of popular power in Venezuela, but stress that the process must be squarely in the hands of the people – the grassroots base of the revolution – and not in what some call the Chavista establishment. Q 11: What’s the general mood of the people, if you could perceive it, in the area you were living? The first word that comes to mind is a mood of determination. Despite threats coming directly from the White House that the US would take ‘strong action and swift economic actions’ against Venezuela if the Constituent Assembly elections move forward, people in El Valle and elsewhere turned out in record numbers. Today, with such bullying growing ever more aggressive, communities and movements continue to assert their right to direct democratic participation in their political system, as they work, by sector and by region, to revise their constitution. 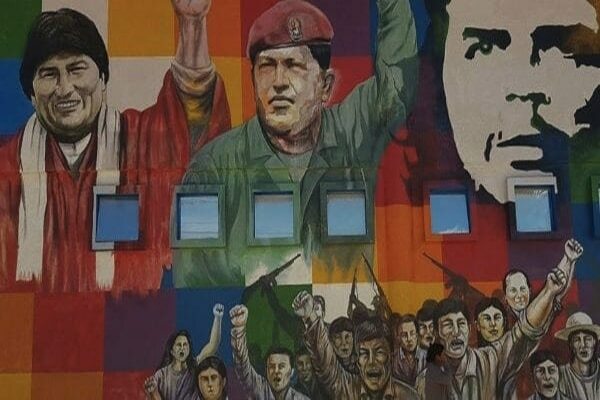 What impresses me most is the balance of pragmatism and revolutionary vision I’m witnessing, as people make concrete proposals and take concrete actions to address the many pressing challenges at present at the same time that they work to further deepen and radicalize the Bolivarian Revolution. Thank you for sharing your experience and helping us perceive reality prevailing in Venezuela.